Our wide range of glass engraving is flawlessly designed to perfection to ensure highly attractive and regal looks. 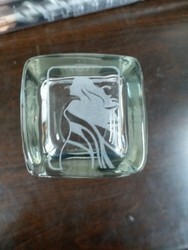 We are indulged in providing Glass Engraving to our clients. These are made from high quality of raw material which ensure durability at its user end. Glass engraving in laser up to 4 feet by 3. 25 feet all designs & photos also. These product are available in market at competitive rates. 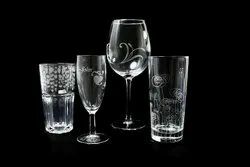 With vast industrial expertise and affluent knowledge of this arena, we are readily instrumental in providing world class Glass Engraving Service. As per the detailed desires of our clients, these presented services are broadly cherished. In addition to this, these could be altered as per the varying desires of our clients. We are expert in engraving on glass according to your demand . Can make any design and write anything on glass. Justifying our repute in this competitive market, we are readily engaged in the arena of offering 3D Crystal Glass Engraving Service. In tune with the pre-set industry set norms and principles, these services are enormously in demand and appreciated in the market. Apart from this, we have chosen dexterous and highly capable personnel to render these so as to preserve their supremacy. Efficient name in the industry involved in offering the optimum quality of 2D Glass Engraving. Engraving is a unique way to add that special name or message to your gift. This is ideally suited for all kinds of glass ware. We also provide customized services according to clients requirements. Glass engraving and etching with a CO2 laser produces a beautiful frosted effect, making your glasswares appear more sophisticated and personalized. Logos, text (and just about anything else!) stands out even more as the laser creates an effect that makes your engraved design really "pop" off the glass background.